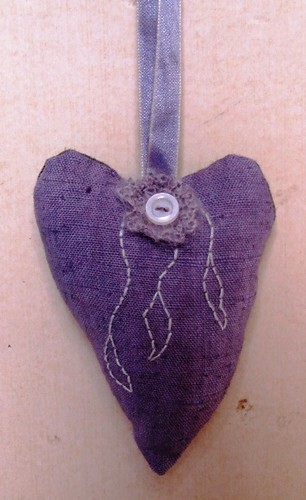 Lavender Filled Heart (crafting 365), originally uploaded by gilfling. sometimes hope, sometimes melancholy, sometimes joy, sometimes sadness, sometimes wonder, sometimes loneliness. Blogging is not coming naturely to me at the moment, I am enjoying just working away on small projects, creating, thinking, pondering, hand stitching, finding a rhythm in the things that I do. Many dolls are works in progress, I am producing groups of items for the up and coming (not for a while but always sooner than I can imagine, holiday season) and for the countless craft fairs I have booked myself into for the remainder of the year. I have taken a wee break from painting due to other work, but as ever, one thing inpsires another and even as I am stitching, hand-dying fabrics, and thinking of doll stories, ideas are being born for new artwork. I love the cyclical process of what I do and how everything relates and integrates. Last year I was so unprepared for the holday season in every way and this year I have vowed to work myself gently into it. Making the things I love to make, a repetition of tasks that calm me and inspire me. Knitting, then felting, then crocheting, then embroidering, then beading, then stitching my cuffs (I love the whole 1,2,3,4 etc methodical sequence of creating these and the object that is the end result. Just building up an inventory of items and hoping that somehow, somewhere, some people will love them as much as I do. My accessories shop is starting to look as if I actually take care of it, and I had a moment today when I just felt satisfied and pleased. A realisation that I have finally found my aesthetic. I guess it has always been there, especially in my artwork, but today really was the first time I truly felt happy with my accessories shop. The banner, the avatar, the featured items and my recently posted items, evan the photography (something I have struggled with for such a long time) all a perfect reflection of me and the things I love to make. The colours and tones, the muted, aged feel and atmosphere that comes from the things I create. Of course I will never be completely 'there' as in reaching a final destination, but I do hope my work will continue to develop along with my aesthetic and personal taste and character that hopefully is evident through all my artwork and the things I am drawn to creating. Gosh I had so many other things to talk about, but I guess this is where my mind and thoughts were taking me today. I do however have some very exciting news which I shall reveal in my next blog post. I do hope you are well, happy and satisfied with all that you are 'creating', whether that be objects to cherish, or finding your path in life. Lovely lavender heart and I hope your knee and gashes are better!